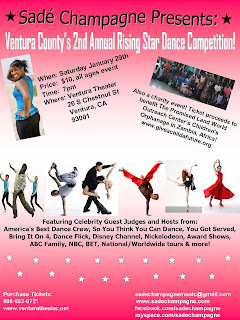 The best and most creative dancers from all over Southern California will be competing for cool awards and prizes! This is also a charity event- ticket proceeds to benefit the Promised Land World Outreach Center's Children’s Orphanage in Zambia, Africa! America's Best Dance Crew, So You Think You Can Dance, You Got Served, Bring It On 4, Dance Flick, Disney Channel, Nickelodeon, Award Shows, ABC Family, NBC, BET, National/Worldwide tours & more! Last year’s show had over 750 people in attendance, raised several thousand dollars for the Zambia Orphanage, had celebrity guests from all over California, and was featured on multiple radio stations, blogs, newspapers, and more! 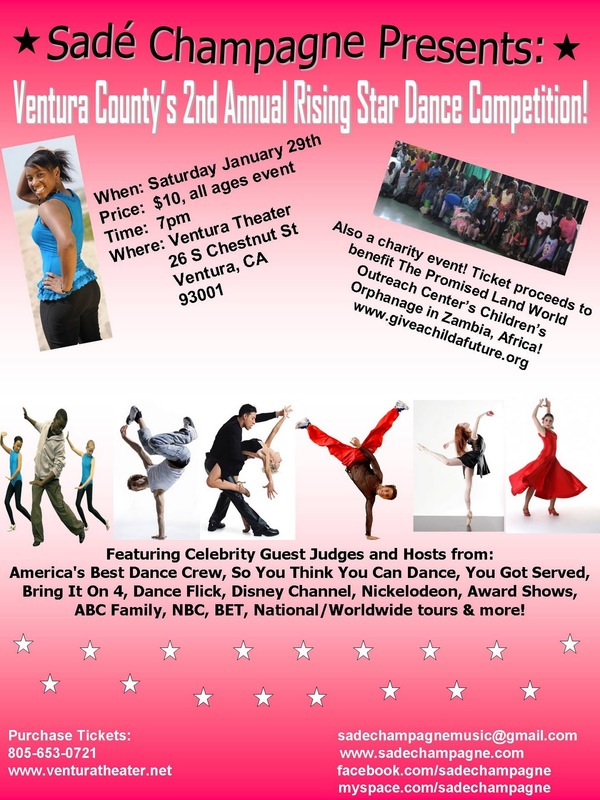 Tickets can be purchased at the Ventura Box Office, but get your tickets early because this year's show is sure to sell out! Dallas Mavericks forward Caron Butler learned all about hard work and supporting a family at an early age. As a teenaged father, he worked at a Racine, Wisconsin Burger King, learning the ins and outs of the fast food business-- from janitorial to cash register duties. Today, all the hard work has come full circle. The 30-year-old baller owns sixBurger King restaurants in Virginia and North Carolina, and says its one of the best business decisions he's made yet. BlackEnterprise.com talked with Butler about why he chose the franchising route and how Magic Johnson inspired him to keep his eyes set on business success after the NBA. BlackEnterprise.com: As a youth, you once worked at a Burger King. What did you learn from that early experience? Butler: At the time, I was supporting my first child. I was 15 years old. So it was the main reason I got a job. I was trying to make ends meet at home, supporting a family. I learned so much, like how to work with people, time management, responsibility, and professionalism. I got to work in all areas of the business, from janitorial to cashier to drive-thru to stocking. What led you to pursue an opportunity to buy into a Burger King franchise? I was presented with the opportunity to get into the franchise and thought it was a great way to branch off into business. It’s a situation with Burger King where you can’t lose. You can look at the Burger King name and its proven success in the fast food industry. Working there two years as a teen, knowing how things function inside and out, I thought it was a great investment. Their franchises will live on and you’ll continue to group and double your value. Did you get any insight or advice from others about this business venture? I talked with [Earvin] Magic [Johnson]. He’s the blueprint. He’s transcended the game on the court and off the court. You name it, he’s doing it -- from Starbucks to theaters to movies . Who else to model yourself after but one of the greatest? What other entrepreneurial plans do you have, and what advice do you have for others interested in pursuing franchising? I look forward to expanding and doing more things with Burger King--maybe purchasing more locations. I'm also looking into movie industry. Advice? I would say just educate yourself in whatever you decide to invest in. 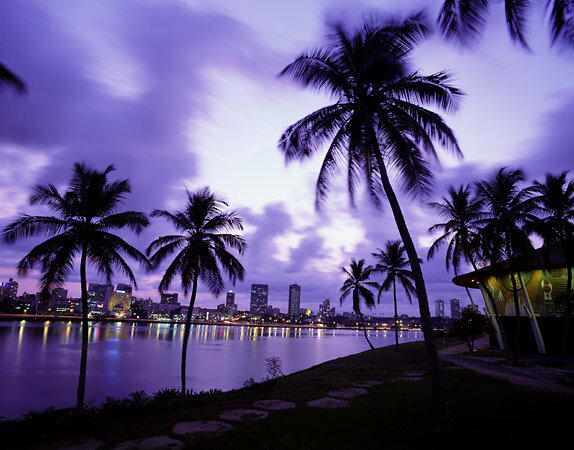 The Africa Channel Wednesday announced it has launched its 24-hour high definition feed in Time Warner Cable's New York City footprint. The HD launch of the network will reach more than 1 million digital customers Time Warner Cable's New York City area footprint, which includes four NYC boroughs (Manhattan, Queens, Staten Island and western Brooklyn), Westchester County (Mt. Vernon), Hudson Valley (Orange, Sullivan, Ulster Counties and parts of Dutchess, Greene and Delaware Counties) and Bergen and Hudson Counties, New Jersey, according to the network. "The HD launch in New York is a significant milestone for The Africa Channel as it demonstrates the value of the high quality entertainment available on a network that showcases the incredible beauty and culture of Africa," said Bob Reid, Africa Channel executive vice president and general manager in a statement. "We are delighted that our New York City viewers are now able to appreciate our unique programming through the superior quality and richness of high definition." Jeffrey Hirsch, chief marketing officer for Time Warner Cable's East Region added that the Africa Channel HD launch "demonstrates our commitment to delivering the very best in high definition programming to New Yorkers. Time Warner Cable offers over 150 high definition channels, and we'll continue to enhance our high definition offerings to provide our customers with the best variety of entertaining and multicultural high definition programming that reflects our diverse market." NASHVILLE, Tenn. -- A Nashville school celebrated a big milestone Thursday. Robert Churchwell Magnet School, formerly Wharton Elementary School, was officially dedicated during a ceremony.Named after Robert Churchwell Jr., the school is Nashville's first museum magnet school that serves students pre-K through fifth grade.Churchwell was the first black journalist to work at a prominent southern newspaper, the now-defunct Nashville Banner.His son was at Thursday's ceremony and said his father would be proud. "I was just thinking how he would love to be here," said Andre Churchwell.Several school officials and Mayor Karl Dean spoke at the ceremony, and all the students were in attendance. They also unveiled a portrait of Churchwell that will hang in the school's hallway. Copyright 2010 by WSMV.com. All rights reserved. In his first news conference after his midterm losses, President Obama reminded his audience that the important battle for the U.S. is remaining on top of global competition. If he's looking for a model, he need look no further than Spelman College in Atlanta -- the private, independent, historically black school for women -- and its strong science, technology, engineering and math program (STEM). In October, undergraduates Jonecia Keels and Jazmine Miller won the 2010 AT&T Big Mobile on Campus Challenge for creating a next-generation e-learning mobile application. Previous winners of the competition were from Harvard and Stanford universities. The women split a $10,000 scholarship and had their choice of a mobile device. The duo's mobile-only creation is the HBCU Buddy. The app, free on iTunes, educates users about historically black colleges and universities. It has customizable social networking features and information about every HBCU. Michele Brittingham of AT&T Services says the HBCU Buddy "is a very well-put-together and well-thought-out mobile application." Keels is in her first of two years studying computer engineering at Columbia University. She is part of Spelman's dual-degree engineering program. She spent three years in Atlanta and will receive a Spelman bachelor of science degree. 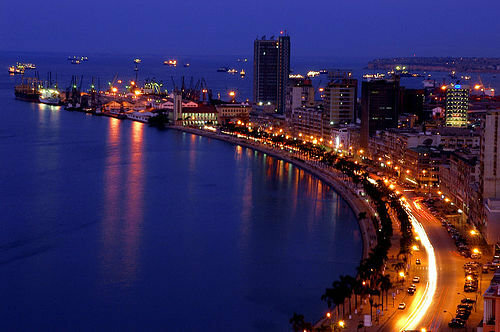 In 2012 she will also earn a bachelor of engineering degree from Columbia. Engineering schools at 12 universities, including Georgia Tech, North Carolina A&T and the University of Michigan, participate in the program. Miller, a computer science major, will graduate from Spelman in 2011. Miller says that Spelman's computer and information sciences (CIS) department trained students so well that failure was never an option. And that sentiment isn't just words; CIS students succeed at numerous endeavors. Both women were co-captains of Spelman's robotics team, the SpelBots, who are sponsored by the National Science Foundation. The SpelBots participated in its fourth International RoboCup tournament and tied for first place in the 2009 RoboCup Japan Open tournament. Founded and coached by CIS Chair Andrew B. Williams, the SpelBots were also the first all-women and African-American undergraduate team to compete. The SpelBots wrote the operating code for the robots to play autonomously, generally a graduate-level task. "It gave us the programming mentality to compete in the applications competition," says Keels. That same year, Keels and Miller were accepted into a weeklong session at Apple Inc.'s Cocoa Camp, where Apple engineers focused on building iPhone apps. Keels says, "We learned the basics about programming and then went off and taught ourselves the rest." The knowledge proved to be invaluable in the AT&T competition. Keels says, "We are programming geeks and knew that we had an opportunity to win, and a chance to compete and find out how we could do." To prepare for the competition, for three weeks they worked up a game plan, then spent the next six weeks programming for about eight hours a day. They conferred on Skype and used "a Web repository that allowed us to both touch and change the program in real time." The challenge began in March 2010 and culminated in September, when AT&T chose three finalists, evaluating the apps for usability, quality, innovation, utility and marketability. "We made a presentation and were informed that we were the grand-prize winners," says Keels. Since 2006, Spelman has received more than $31 million in grant funding for STEM programs and research. The school ranks second nationally in sending black graduates on to science and math Ph.D. programs, and from 1997 to 2006, it produced 150 students who earned Ph.D.s in science and engineering, according to a National Science Foundation survey. Founded in Atlanta in 1881, Spelman has more than 2,200 students from 15 foreign countries and 41 states. Beyond its liberal arts tradition, the school offers bachelor of science degrees in majors that also include biochemistry, environmental science and physics. Vashtie Kola proves that despite living in a man's world, there's always room for women to shine. The hip designer and acclaimed video director recently teamed up with Nike, becoming the first female designer to ever collaborate with the Air Jordan line. 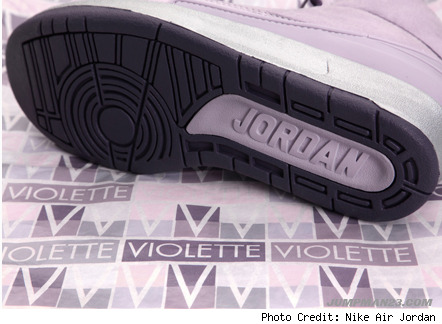 The limited edition Ladies' Air Jordan 2 Retro sneakers reflect the low key designer's tom-boy style, with an hint of femininity. "The shoe was inspired by my line Violette, myself and the girls who would wear them on their feet," Kola told BlackVoices. "I wanted them to be feminine and chic, but masculine and true to the original form. Balance has always been a key theme used in my designs and daily life, so I wanted to balance masculinity and femininity with this sneaker." The Air Jordan 2 collaboration is one of several instances the New York-based artist has teamed up with the sneaker giant. "I worked for Nike in the past at their 255 STUDIO location in Manhattan as well as a few Nike campaigns." Kola told BlackVoices. "My presence within the Nike family inevitably crossed over into the Jordan family." Kola's Retro designs feature a lavender and deep purple colorway, along with silver accents around the laces. "It's the 25th anniversary of the Jordan 2 and traditionally you give someone silver when celebrating 25 years. I incorporated metallic accents that frame the shoe to honor that," said Kola. 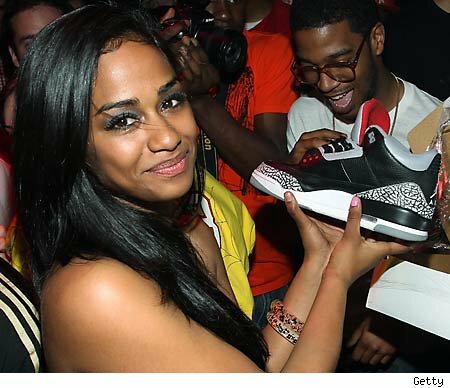 While the Retro sneakers mark a feminine milestone for the Jordan 2 line, it's yet another day in a male dominated industry for Vashtie Kola. "I'm pretty used to being apart of the female minority in boys circles," said Kola. "For the most part, I'm used to knowing how to hold my own and can do it pretty easily especially if the men I'm working with are open to working on an equal plane with a female. And most times they are." 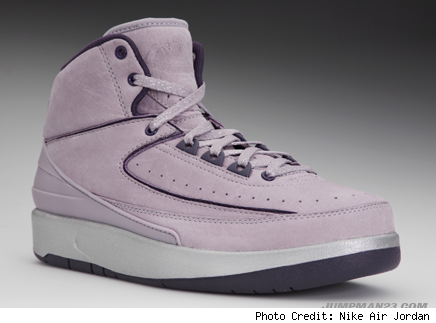 The limited edition Air Jordan 2 sneakers hits stores this Saturday October 2nd. Be sure to get them while they last. The most scrutinized school in the Toronto District School Board has a very public feather in its cap — thanks to those dastardly provincial EQAO tests. The inaugural Grade 3 class of the Africentric Alternative School significantly outperformed both the board and the province in this year’s results. The school’s 16 Grade 3 students collectively had 69% of students reaching the provincial Level 3 standard in reading, 81% in writing and 81% in math. For the board, those scores sit at 60%, 70% and 71%. For all of Ontario, they’re 62%, 70% and 71%. Sure, it’s only the first year — and educators always caution it’s important to look at improvement over time. As well, the Africentric school’s 2009-10 class was a small one where even a few high-performing — or low-performing — students could significantly skew results. Still, it shows the Downsview-area school must be doing something right. It also proves what the black community already knows — black students are capable of high levels of achievement. “When you see achievement, both great and small, especially in the EQAO, it just provides another context for the reason why you need a school like the Africentric Alternative School,” says principal Thando Hyman, adding enrolment has doubled to 160 for the school’s second year. Was the school simply blessed with an already high-achieving crop of kids? Nope, she says. “The students really run the gamut … Some kids at the beginning of (last) year were having challenges in reading and so it really required ongoing consistent teaching and continual motivation,” says Hyman, adding the school “still has some work to do” in reading. High expectations, consistent routines, a strong sense of purpose based on African cultural principles that students are steeped in during daily opening exercises, after-school tutorials and close, caring attention by teachers are things Hyman believes have fuelled students’ success. With the TDSB battling a 40% dropout rate among black students, she thinks those factors can help students elsewhere do better too. In the city’s east end principal Glenn Boden credits extra professional development and staff collaboration time — bought by grants under a provincial education ministry struggling schools program — for his school’s dramatic improvements. Last year’s EQAO results at Cedarbrook Junior Public School were not so hot — see the above note on the hazards of looking at a single year. But since 2005 Grade 3 students’ Level 3 reading performance has shot from 32% to 62% and Grade 6, from 44% to 83%. Grade 3 math has gone from 29% to 76%; Grade 6 from 47% to 66%. Cedarbrook is in the top third of the TDSB’s list of its neediest schools. Teachers meet regularly to analyze student test data and plan how they’ll collectively tackle weaknesses. They watch each other teach and have worked on getting their marking schemes in line with each other so they’re more standardized and less subjective. The school also set up a professional learning library where teachers can look up research on teaching and get students books aimed at improving specific academic skills. Last year staff targeted students performing immediately below the Level 3 standard and worked throughout the year to move them up a level. The results “surpassed our expectations,” says teacher Carri Brown. Two schools. Two successes. And one still-controversial test that allows those successes to shine. We view contribution and service as a celebration of one’s gifts. We celebrate the grace that has been bestowed upon us as we honor our gifts though sharing them. There are men, women and children who, right now, do not have clean water to drink – we celebrate the fact that we are able to help quench their thirst. We believe every person on the planet should have access to clean drinking water. This year we celebrate our birthdays by giving the gift of clean drinking water through charity:water. Join us. 100% of the money raised goes to digging wells and to clean water projects in developing nations. 100% of our gifts will change the world, one person at a time. And make your next birthday a celebration of your gifts by raising money for clean drinking water too. We’ll take the top three fundraisers with us to Africa to see the wells when they’re built. Junior Bridgeman works the same way he played basketball back in the day-teamwork. No wonder his three children want to join his team. Former NBA star Junior Bridgeman didn’t expect his children to follow him onto the basketball court or into the family business. All he expected was whatever they chose to do they gave it their all - starting at the bottom and working their way up. Eden and Justin Bridgeman are following in the famous footsteps of their father, Junior. They know that while his name can get them in the door, it doesn’t mean it will keep them there. A few of the athletes shifted uncomfortably in their seats, and it’s pretty easy to visualize the reaction of today’s pampered NBA stars like Kobe Bryant or LeBron James if that sentiment was broadcast on their turf. But Bridgeman just laughed. Perhaps, it’s because the last laugh really is his. He owned that particular Wendy’s plus several others. Today his company runs 162 Wendy’s and 121 Chili’s and is No. 3 on the Restaurant Finance Monitor’s Top 200 franchisee-owned companies, with $507 million in revenue. In addition, he has other restaurant deals in the works. And while nothing beats the high of winning a game at the very top competitive level, he says giving jobs to people and watching them develop is heart-warming, if not exactly heart-thumping. Always practical, Bridgeman took the entry exams for law school his senior year, in case he wasn’t drafted into the NBA. He became interested in business when he served as the players association’s treasurer. He bought into three Wendy’s when he was still playing and at the end of the year, his manager came to him and told him, they’d made $1 million. “I said, ‘Great,’” and he said, “We broke even.” “Oh,” was his only response. Bridgeman is not flashy. The 6’5” former small forward/shooting guard is more comfortable out of the limelight than in it. Perhaps because there wasn’t 24/7 media attention when he played from 1975 to 1987, Bridgeman was a hard-won cover story for Franchise Times (Notice who’s on the cover - it’s not him). Modesty, hard work and paying your dues are traits the Bridgemans passed on to their children - both through their DNA and parenting. While they had more opportunities than most kids - “We are blessed,” all three admit - they also had to work for it. They may have received a car when they turned 16, but they were “used cars, with lots of miles,” Doris stresses. And just because two of them work for the family business doesn’t mean, they were allowed to just show up for the party. They all worked shifts at the restaurants, and the younger two even cleaned the restrooms at Bridgeman Foods’ office as teens. Junior Bridgeman dunks over the Celtics’ Larry Byrd, before he traded the NBA for the fast-food fast track. Justin Bridgeman remembers watching his dad on the basketball court, and playing with the other team members’ kids in the neighborhood. He laughs as he describes the “Billy Madison-style” birthday parties with giraffes and break dancers he attended in L.A. But this is not a name-dropping family, so don’t expect him to name names. “We realized that was their success,” he says about his parents. “We had nothing to do with it” - and therefore, nothing to gain by bragging about it. Their parents weren’t impressed by L.A.’s siren call, either. “We looked at our stay in L.A. as a long vacation,” Doris Bridgeman says. “The chauffeur was my mom … the cook was my mom,” Eden says. “And we were the maids and butler,” Justin adds, laughing. None of the siblings were expected to play basketball - “The shorts were too long and the jerseys too baggy. I was a girly-girl,” Eden says, although she has the height which leads strangers to speculate about her innate ability to dunk. As the oldest, Justin says, he felt pressure about following in his dad’s footsteps in sports, but it came from himself or well-meaning acquaintances, never from his dad. The middle child, Ryan, 28, did play basketball, but when we talked on the phone - he’s currently in Los Angeles with a yearlong internship with Taco Bells’ finance department - Ryan didn’t notice any of the boys or fathers on his team being particularly impressed that a professional athlete was helping coach. When the two brothers collected trading cards, Ryan always looked for their father’s cards in the packs of basketball cards, while Justin went after the more lucrative baseball stars with a high face value. “He collected for love, I collected for profits,” Justin says, grinning. Ironically, it’s Ryan who went into the finance side of the business. Ryan defends himself, saying it’s pretty unique to have your father’s trading card. The second generation of a business is often criticized for expecting to waltz into the corner office before the ink is dry on their college diploma. Not so here. Justin is a general manager for a Chili’s in Chicago and Eden is a marketing manager for 49 Chili’s. Ryan has an internship in order to learn the business, before moving back to Louisville and getting involved in the family business. Both Ryan and Justin have MBAs, and Eden is looking into getting hers. “I wouldn’t want to start at the top without experience, because this is an experience-driven business,” Justin says. “The boys wanted to prove themselves elsewhere first,” Doris says. It was only because of the economy and the timing of the job opening in marketing that led Eden to take the job straight out of college, she adds. Which is why Justin and Eden headed to Chicago and Ryan is learning the ropes at Taco Bell. The Bridgeman family: Ryan; Eden; Parents, Junior and Doris; and Justin. One nugget of advice Bridgeman gave his fellow athletes was that being a franchisee isn’t like sitting on the bench and collecting a paycheck. He admitted that when he first got into Wendy’s, he didn’t realize how much your success depended on being hands on. Just because your franchisor trains you on how to run the restaurant, doesn’t mean it will also teach you how to run a business, he cautions. “In order to be successful, you’ve got to know what you’re doing and I didn’t know what I was doing,” he says. “I went back for training.” He also started putting in 12- to 14-hour days. But while people can be the greatest challenge, they also can be the greatest reward. It’s the people - employees and customers - who make the entire family want to be in the business. So why would the siblings want to follow their father into such a stressful business? Justin and Ryan started working at Wendy’s in high school. Justin was the only one of the three who both opened and closed the restaurant, he says. Because he had friends who also worked at the same Wendy’s, it was fun, but the only perk he received was that his schedule was designed around all his other activities. By the time Eden was old enough to work, Chili’s had been added to the portfolio and she filled in as hostess and ran food orders. All three were exposed to sports and music lessons and in Eden’s case, dance. Justin excelled at music and art. “He’s our Renaissance man,” Eden says, teasing, but also proud. Ryan was the athlete, who, apparently, didn’t appreciate the musical training. Justin originally wanted to work in the music business, but halfway into his schooling he discovered “the music industry isn’t for people who love music,” he says. The second generation brings a fresh perspective to successful family-owned businesses. In most cases the kids didn’t grow up worrying about money, enough food to eat or whether they’d be able to go to college. But their challenge is to be seen as a contributor, not a legacy. And as Eden points out, they put more pressure on themselves to earn their spot in the business than their parents or coworkers do. “It’s all about family pride,” she says. Although operations may not seem as creative as marketing, Justin says he enjoys the problem-solving aspect of it - such as, “What’s going to drive our age group into a Chili’s?” As someone who thrives on the nightlife, Chicago was a good landing spot for Justin, who appreciates trendy restaurants that stay open after his job ends for the day. “I like the experience of people coming together around food (and drink). That’s what makes life,” he says. And while the two of them have no control over the menu at Chili’s, they can alter the atmosphere. Justin is concerned with repeat visits and creating a spot where people like to hang out more than just occasionally. That means friendly, efficient staff who make people feel welcome. The three siblings are interested in someday taking over the company, although their father plays the details of his business close to his vest, Ryan says. “What dad has created - his time and effort - I don’t want that to go away,” Ryan says. And for Eden, the decision is easy: “We’re the owner’s children. We’re a team ... and we have the ear of the top man,” she says. And like an orchestra, they all play a different instrument. And they play nicely. Justin and Eden both majored in marketing, but he chose operations, and never blinked when the position in marketing opened up. “She’s better at it,” he says about his sister. The winning secret at Bridgeman Foods and ERJ Dining, the Chili’s side of the business, is that “Junior’s allowed people to work with him, not for him,” Thompson says. Thompson has been with Bridgeman since the first day the company started in May of 1988. He was working for Wendy’s International, when Bridgeman needed an operator after buying his first Wendy’s. Neither of them thought the business would ever grow to its current size, he says. It’s not about the money or the glory, it’s about giving people jobs and opportunities so their kids can go to college and they can afford a decent home and lifestyle. “Every Christmas, every manager with a kid 12 and under, we buy the kids a present,” Bridgeman says. The tradition is because as a child he remembers getting a present from the steel mill that employed his father. It’s all about: “Who have you helped?” Bridgeman says. No formal succession plan has been put in place - mostly because their father is having too much fun right now running the plays. If Junior Bridgeman ever does decide to retire, perhaps a good third career would be running a day care. He and his wife - “the backbone of the family,” as his daughter puts it - seem to have a pretty good track record raising the next generation of hard-working siblings who get along famously. Let’s hope his fellow athletes, like his children, follow in his footsteps. Her love of acting and her desire to bring quality entertainment projects into production prompted her to form her own production company, Harpo Productions, Inc., in 1986. Today, Harpo is a formidable force in film and television production, as well as magazine publishing and the Internet. In 1988, Harpo Productions, Inc. acquired ownership and all production responsibilities forThe Oprah Winfrey Show from Capitol Cities/ABC, making Oprah Winfrey the first woman in history to own and produce her own talk show. The following year, Harpo produced its first television miniseries, The Women of Brewster Place, with Oprah Winfrey as star and Executive Producer. It was quickly followed by the TV movies There Are No Children Here (1993), and Before Women Had Wings(1997), which she both produced and appeared in. Despite her complete dominance of the daytime talk show field, Oprah Winfrey had not given up her acting ambitions. In 1998, she produced and starred in the feature filmBeloved, adapted from the book by the Nobel Prize-winning American author Toni Morrison. Winfrey has long used her television program to champion the works of authors she admires, including Morrison, and her longtime friend Maya Angelou. Her influence over the publishing industry exploded when she began her on-air book club in 1996. "Oprah Book Club" selections became instant bestsellers, and in 1999 Winfrey received the National Book Foundation's 50th anniversary gold medal for her service to books and authors. She herself has authored five books. A proposed book on weight loss, to be co-written with her personal trainer, has received a publisher's advance fee reported to be the highest in history. Oprah Winfrey's business interests have extended well beyond her own production company. She is one of the partners in Oxygen Media, Inc., a cable channel and interactive network presenting programming designed primarily for women. With her success, she has also become one of the world's most generous philanthropists. In 2000, Oprah's Angel Network began presenting a $100,000 "Use Your Life Award" to people who are using their own lives to improve the lives of others. She now publishes two magazines, O, The Oprah Magazine, and O at Home. The launch of her first magazine was the most successful start-up in the history of the industry. When Forbespublished its list of America's billionaires for the year 2003, it disclosed that Oprah Winfrey was the first African-American woman to become a billionaire. In the 2008 presidential election, Winfrey publicly endorsed a political candidate for the first time, hosting a fundraiser for SenatorBarack Obama and appearing with him at campaign events. It is widely believed that her support was crucial to his winning the Democratic nomination -- and the Presidency itself. In that election year, she also announced plans for a new broadcasting venture with the Discovery Health Channel, to be renamed Oprah Winfrey Network (OWN). In an interview on the Larry King program at the end of that year, she announced that in 2011 she would end her run on The Oprah Winfrey Show, after 24 seasons and over 5,000 broadcasts. She has since revealed plans to host a new program on the Oprah Winfrey Network.